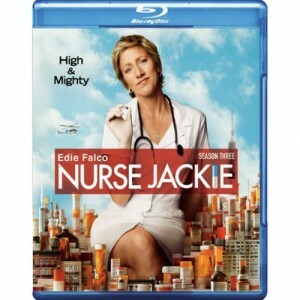 Jackie Peyton otherwise known as Nurse Jackie is played by Edie Falco and is a nurse at All Saints Hospital in New York. She is a sever drug addict, pathological liar about almost everything, and cheats on her husband whenever she gets a chance. On top of that, if someone tells her what she is doing is wrong, she loses her cool. This is the story of Nurse Jackie in so many words. She is the series main star and it’s really difficult to find something good about her. In this 3rd season, a couple of Jackie’s friends figure out she is a drug addict and confront her about it. She denies it for as long as she can while her husband and her are having a really tough time of having a happy marriage. With all of this terrible stuff going on, there are a couple of characters to balance out the series in making it funny and light hearted some of the time. Below is an episode breakdown. Season 3 picks up immediately where Season 2 left off. Jackie and Kevin have an altercation over his recent discovery but Jackie denies being an addict. Jackie returns to work where O’Hara gives her the cold shoulder. Zoey has since slept with Lenny and animosity is still rife between Coop and Sam. Kevin falls for Jackie’s emotional blackmail and enrols Fiona at the same school as Grace. Fiona starts at her new school, O’Hara continues to give Jackie the cold shoulder, and Eddie asks Jackie to make his friendship with Kevin a little easier. Kevin’s younger sister Tunie crashes at the Peyton household and Jackie has another encounter with the drug dealer she ripped off. God steals a piano. Kevin invites Eddie over for a barbecue to set him up with Tunie, Coop ‘competes’ for Chief of the ER. A rat eats Jackie’s stash in the hospital basement and Coop’s moms get a divorce. O’Hara takes a page out of Jackie’s book and bends the rules to help a patient. The statues of the saints are finally removed from the chapels. Meanwhile, Jackie clashes with the new nurse named Kelly Slater and Eddie considers going out with Tunie. The new nurse Kelly charms the hospital’s staff except Jackie, meanwhile a patient eases Dr. Cooper’s pain who is depressed about the split of his parents. Kevin discovers a secret stash in a dental floss dispenser while Jackie steals drugs from the oncology ward. Jackie criticizes Kelly’s interaction with two flirty high school girls while Mrs. Akalitus seeks Thor’s help with a new phone system. Jackie can’t arrive in time at her daughter’s pageant. Just when Jackie has run out of pills, she runs into a confrontation about the drugs from Oncology that disappeared. Coop tracks down an old girlfriend on Facebook when he decides to start his own family. Heart problems make Zoey revisit her relationship with Lenny. Jackie lands on probation because of the drugs she swiped from the Oncology Department. Meanwhile, in a case of like mother, like daughter, Grace requests that her psychologist put her on medication. And Coop steps up his wedding plans and books the chapel. O’Hara steps in to help Jackie dose down. Elsewhere, an edgy Kevin appears to be holding something back from both his wife and Eddie; Mrs. Akalitus gets bad news about the impending visit by the first lady; Zoey throws a party for her fellow nurses; and Kelly makes a confession to Jackie. In addition to sweating out a mandatory urine test demanded by HR, Jackie tries to avoid an inevitable confrontation with Kevin in the Season 3 finale. Meanwhile, Coop’s combined birthday and wedding day plans go off with a major hitch; Mrs. Akalitus is overjoyed to have her religious statuary back and in the hospital chapel; and Fiona gets a little too fired up in school. The video presentation is incredible. It has the glorious 1080p transfer in 1.78:1 aspect ratio. There was no noise that I noticed throughout the season while everything looked clear. I didn’t really notice any grain either. The colors were vibrant especially all the blues and whites. The blacks were deep and inky and the flesh tones were smooth and natural. The texture was great and the depth of the city was amazing. Very nice video presentation. The audio has an impressive DTS-HD 7.1 mix. I really do love that Lionsgate is pushing for 7.1 sound. 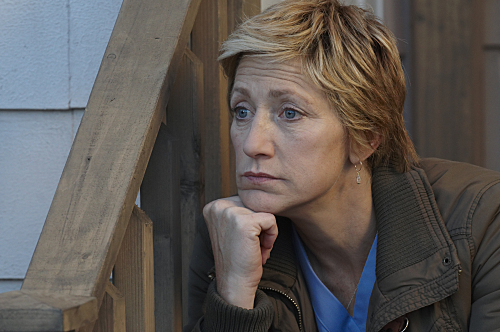 Even though, ‘Nurse Jackie’ isn’t typically the show that warrants a 7.1 audio mix, it’s still impressive to have. The dialogue is crystal clear with no hissing or cracks. All the ambient noise in the city and the hospital is distributed on the rear channels with hints of the side channels and it sounds great. The score and music never trumps the dialogue and is always pleasant to hear. While the 7.1 mix may not need to be on a series like ‘Nurse Jackie’ it is definitely impressive. Audio Commentaries – There are five commentaries total to this season 3 bluray. Three of them are given by Falco herself along with a few of the producers. The other two commentaries are from some of the supporting actors. The commentaries with Falco and the producers are more for the technical aspect buffs of film with a hint of Falco telling us how she views and plays Jackie. Too many people talking on this commentary. The other commentary featuring some of the actors is a little better. They give insights better to the story and characters and some anecdotes on filming. At points though, they ran of out of things to talk about. Inside Akalitus (HD, 14 min.) – This was one of the coolest features I have seen in a long time. This little extras follows Anna Deavere Smith who plays Gloria Akalitus on the show. There is some powerful insight on not only her character but Anna herself and her life. Really cool stuff here. She’s awesome. Jackie’s Guys (HD, 12 min.) – Sort of like the extra above, this is more of the same thing with some of the other actors who talk about their lives and how they prepare for roles and how they got into the business. I love seeing this type of stuff on these discs. Gag Reel (HD, 8 min.) – A longer than usual gag reel with the same flubbed lines and pranks we have seen before. A decent Gag reel. If you’re a fan already of ‘Nurse Jackie’ then you already know you are picking this up. The audio with its 7.1 sound is AMAZING and the video is top notch. The extras, especially the interviews with the actors are incredible. If you are new to Jackie, then I highly recommend you pick the seasons up and watch them. You won’t be disappointed. If you find this bluray for under $25, then pick it up. This entry was posted on Tuesday, February 28th, 2012 at 8:36 pm	and is filed under News, Television. You can follow any responses to this entry through the RSS 2.0 feed. You can skip to the end and leave a response. Pinging is currently not allowed. « Paramount Will Release A ‘SpongeBob SquarePants’ Film in 2014!! !